Here is something to put you in the holiday mood, check out the new song from Coldplay called, "Christmas Lights". I thought the colorful piano was fun, and what do you think of the violin playing Elvis impersonators in the background and the 'credo elvem etiam vivere' business on the stage? You can download this song here . Happy Music Monday! the piano is amazing! I'd start taking lessons again (after a 15 year hiatus) if I could have a piano like that. does "credo elvem etiam vivere" mean "i believe that elves exist/live" or something like that? Oh man, I love everything about this video. This is awesome. Not a fan of Coldplay in general (most their songs sound the same to me), but this video is to-die-for gorgeous!I want to live in it. I down loaded this tune the second it was available on itunes- love it, love the arangement. starts sad but end on a lift. I love christmas! Simon Pegg is the middle Elvis. Little trivia for you. 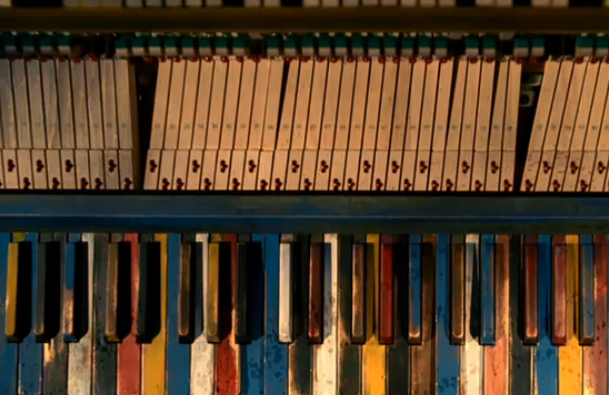 This video makes me want to paint all the keys of my piano in vibrant colours!